The Turtle is one of Seiko's most famous diving watches. The pillow-shaped, oval watch is easily recognized and is one of the most affordable automatic watches. The extremely limited Blue Lagoon is especially highly coveted. When it comes to nicknames for watches, followers of the Japanese manufacturer Seiko are just as creative as their Rolex counterparts. 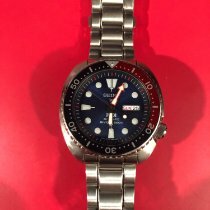 Names like Turtle, Samurai, Sumo, and Monster are familiar to most watch fans and immediately bring clear images of the individual watches to the minds of Seiko enthusiasts. The Seiko Turtle has an oval case that resembles a turtle's shell, hence the nickname. Current models are comparatively large with a diameter of 44.3 mm, though they don't feel oversized thanks to their extremely short lugs. There are multiple versions of the unidirectional bezel, including black, dark blue, blue/red, black/red, and black/blue. The latter is known among fans as the Turtle Batman. The Blue Lagoon model with the reference number SRPB11 is especially sought after. Seiko released it in a limited run of 6,000 pieces in 2017. Characteristic of the Blue Lagoon is the blue design of the dial and bezel. The shade of blue on the first 15 minutes of the bezel is significantly lighter than the area between the 15 and 60 minute markers. Due to its limited numbers, it is relatively difficult to find a new Seiko Turtle Blue Lagoon. 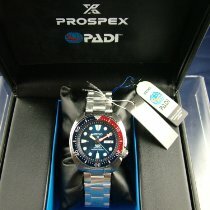 This is also true of its sister model, the Samurai Blue Lagoon with the reference number SRPB09. It was also released as a limited run of only 6,000 examples worldwide. 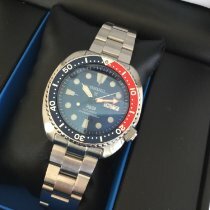 How much does a Seiko Turtle cost? You can buy a new Seiko Turtle with a urethane band for as little as 260 euros. Plan to spend about 30 euros more for models with a stainless steel bracelet. 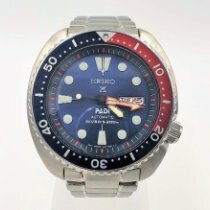 The Turtle PADI, a special model honoring Seiko's partnership with the global Professional Association of Diving Instructors, costs at least 320 euros. The rarest model is the limited edition Blue Lagoon, which runs for about 500 euros. Seiko fans, also known as Seikoholics, can recognize a Turtle instantly. This is due to the pillow-shaped, oval case and the crown located at 4 o'clock – a historic trait of this watch. The dial design is characterized by vibrant hour markers. The large, sword-shaped marker at the 12 o'clock position is yet another identifier of this model. There are thinner indices at 6 and 9 o'clock and the other positions are marked with dots. The luminous material is only missing at 3 o'clock, as this is where the day and date displays are located. Seiko uses its own material, LumiBrite to light up its watches. It is supposed to be especially bright and long-lasting. As is typical of diving watches, the hour, minute, and second hands are also coated in Lumibrite. A nice detail on the Turtle Coke, PADI, and Batman is the red or blue minute hands that match the corresponding bezel. For bands, Seiko employs stainless steel bracelets or flexible urethane straps, the latter being paired with the SRP777K1 and the SRP779K1. You will only receive both variants with the limited edition Blue Lagoon. The stainless steel bracelet has a practical extending function so that you can adjust the length of your band to the thickness of your diving suit. This feature is also useful in summer months if your wrist swells from the higher temperatures. A folding clasp with security push buttons and brackets keeps the watch securely on the wrist. If you want even more safety, you can equip your Turtle with a NATO strap. This would keep the watch on your wrist even if the spring bars were to break. Every version features Seiko's Hardlex Glass , which is somewhere between conventional mineral glass and sapphire glass in terms of hardness and scratch resistance. The crown and solid stainless steel case back are screwed down and guarantee a water resistance of up to 200 m (20 bar). If that's not enough for you, take a look at the Seiko Marinemaster Professional, which, like the Turtle, belongs to the Prospex collection. The Marinemaster Professional with the reference number SBDX013 is water resistant to an impressive 1000 m (100 bar), but also costs around 3,500 euros. 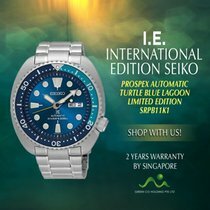 Every model of the Seiko Turtle released after 2016 is powered by the in-house caliber 4R36. This movement winds automatically and has a power reserve of 41 hours. The time can be set to the exact second thanks to the stop-seconds mechanism. Additionally, you can wind it by hand should it come to a stop. The "Magic Lever" System from Seiko is considered especially efficient. The 4R36's balance wheel vibrates at 21,600 A/h. Seiko is generous when it comes to how much the 4R36 deviates per day, ranging from +25 to -15 seconds. Even if this movement is no Swiss chronometer, it feels very well-balanced when worn. The roots of the current Seiko Turtle stretch back to the end of the 1960s with the debut of model 6105. This watch was one of the first Japanese diving watches and was worn by countless American soldiers in Vietnam. The 6105 even made it to the big screen: In the anti-war movie Apocalypse Now, Captain Willard – played by Martin Sheen – wears an example of this reliable automatic watch. In the mid-1970s, Seiko unveiled the follow-up model with the reference number 6309. With a diameter of 45 mm, it seemed enormous at the time. This Turtle was produced until the end of the 1980s. Both vintage watches are extremely hard to come by today, but with any luck, you will be able to buy a 6105 for around 1,500 euros.